Lichen planopilaris (LPP) is an inflammatory disease characterized by a lymphomononuclear infiltrate surrounding the isthmus and infundibulum of the hair follicle of the scalp, that evolves into atrophic/scarring alopecia. In the active phase of the disease hairs are easily plucked with anagen-like hair-roots. In this study we focused on the expression of integrins and basement membrane components of the hair follicle in active LPP lesions. Scalp biopsies were taken in 10 patients with LPP and in 5 normal controls. Using monoclonal antibodies against α3β1 and α6β4 integrins we showed the expression of these integrins and of the basement membrane components of the hair follicle in active LPP lesions and in healthy scalp skin. In the LPP involved areas, α3β1 was distributed in a pericellular pattern, the α6 subunit was present with a basolateral distribution while the β4 subunit showed discontinuous expression at the basal pole and occasionally, basolateral staining of the hair follicle. Conclusion: An altered distribution of the integrins in active LPP lesions can explain the phenomenon of easy pulling-out of the hair with a "gelatinous" root-sheath. Lichen planopilaris (LPP) is an uncommon disease characterized by widespread keratosis pilaris and a progressive inflammatory cicatricial alopecia. The scalp often is the only site of involvement with different manifestations, such as perifollicular erythema and scaling (keratotic spines), patchy or diffuse hair loss, and at the end stage an atrophic cicatricial alopecia with loss of follicular ostia [1–3]. This disease mostly affects middle-aged females without racial predilection. The etiopathogenesis is unknown, although there is an immune infiltrate characterized by actived T lymphocytes (CD4 and CD8), that attacks the epithelium of the infundibula and isthmus areas of hair follicles (the buldge area) and sometimes the interfollicular epidermis with the lower portion of hair follicle being relatively spared . Later findings are perifollicular fibrosis and "artifactual clefts" between epithelium and stroma . Ultimately hair follicles are definively destroyed. The follicular antigen(s) targeted by these lymphocytes are not known. These antigens are thought to be viral, pharmacological or self . Direct immunofluorescence often demonstrates colloid bodies and a linear deposit of fibrin and/or fibrinogen at the dermo-epidermal junction . 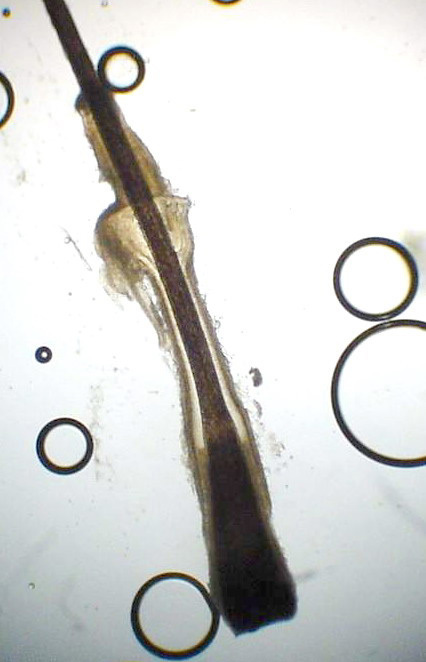 Tipically in the active phase of the disease there is a positive pull test with hairs that are easily plucked with anagen-like hair-roots presenting dysplastic hair roots sheaths. The outer root sheath cells interact with the basement membrane mainly via α3β1 and α6β4 integrins, which are expressed at different levels in different regions of the hair follicle . In particular the aim of this study was to evaluated the expressions of α3β1 ed α6β4 integrins of follicular keratinocytes in LPP, comparing that on pathological skin of 10 patients with LPP and 5 healty patients. Patients attending the Unit of Dermatology of the University of Bari with diagnosis of LPP of the scalp based on clinical, histologycal and immunofluorescence findings. The patients were seen from February to November 2005 (2 men and 8 were women) aging range 18–58 years. Clinical and laboratorial data of the 10 patients with LPP are reported in table 1. Clinical and laboratorial data of 10 patients with LPP. Scalp biopsies were also done in 5 normal scalp controls (2 men and 3 women). The age of the controls range from 19 and 70 years. Informed written consense was obtained from all patients before surgical biopsy. Scalp biopsies consisted of 4 mm punch biopsies taken from the active edges of the lesions and from uninvolved scalp skin in the patients with diagnosis of LPP, and from the mid or posterior crown in the controls. Surgical biopsy specimens were snap-frozen in liquid nitrogen, mounted in Optimal Cutting Temperature 4583 embedding compound (Miles Laboratories, Inc; Naperville, Illinois), and stored at -80°C. Five-micrometer serial frozen sections were cut with a microtome (Microtom, HM 505E, Carl Zeiss, Oberkochen, Germany), transferred onto glass slides (Sigma Chemical Company) and processed for indirect alkaline phosphatase. Briefly, sections were fixed in chloroform/acetone mixture for 10 minutes at 4°C, air dried and incubated with primary antibody (10 μg/ml) diluted in RMPI medium containing 10% FCS. After washing, sections were incubated with secondary antibody (rabbit anti-mouse), washed and incubated with a mouse anti-alkaline phosphatase conjugated antibody (Dako, Glostrup, Denmark). Reactions were developed with red fucsin, sections were counterstained with Mayer's hemalum solution, mounted with glycerol and examined with a Nikon Eclipse photomicroscope (Nikon Corp.). Antibodies F2, F4, and F1 (to human integrin α3) were kindly provided by L. Zardi (IST Genoa, Italy). Antibodies MAR6 and MAR4 (to human integrin α6 and β1 respectively) were a gift from S. Menard (INT, Milan, Italy). α6 (GoH3) was purchased from Pharmingen (San Diego, CA). Monoclonal antibody anti-Ln-1 and Coll IV were purchased from Sigma (St. Louis, MO). Human anti-Ln-5 (GB3) (Vailly et al, 1994) was a gift of G. Meneguzzi (School of Medicine, Nice, France). In the uninvolved areas integrin α3β1 was expressed with a basolateral distribution instead α6β4 was distributed in the basal keratinocyte layer in the Outer Rooth Sheath (ORS) of the follicle (Fig 1). In the involved areas of LPP α3β1 was distributed in a pericellular pattern, α6 subunit was present in a basolateral distribution, while β4 subunit shows a discontinuous expression at the basal pole and occasionally basolateral staining of the hair follicle (Fig. 2). Staining for Ln-1 and collagen IV was similar represented in uninvolved (Fig. 1) and involved (Fig. 2) areas of scalp skin. In involved areas of scalp skin Ln-5 (colocalized with α6 integrin), showed a basolateral distribution as well as integrin α6 (Fig. 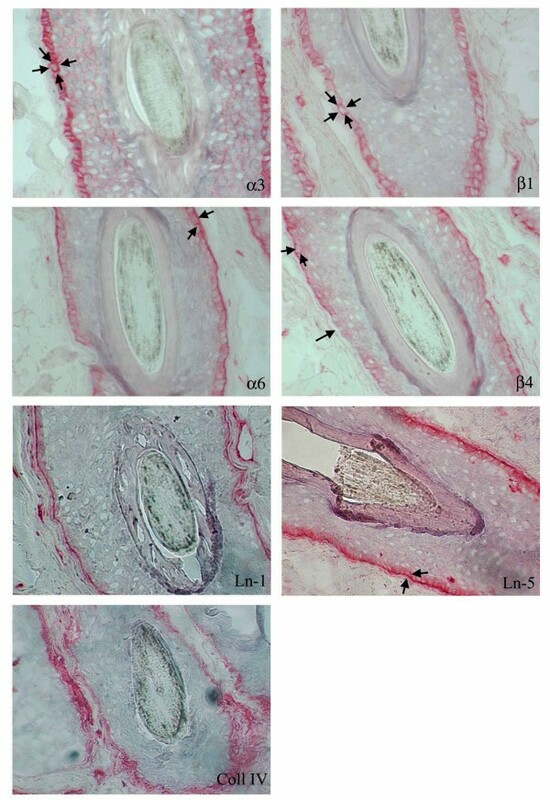 2), instead in normal control Ln-5 and integrin α6 were distributed along the basal layer of the hair follicle (Fig. 1). Ln-1, Ln-5, Coll IV, α3β1 and α6β4 integrins staining in a hair follicle from uninvolved scalp skin of a healthy subject. Ln-1, Ln-5, Coll IV, α3β1 and α6β4 integrins staining in a hair follicle from involved scalp skin of a patient with LLP. LPP is an inflammatory disease characterized by a lichenoid inflammation surrounding the isthmus and infundibulum of the hair follicle of the scalp and other body areas, that evolves with atrophic cicatricial alopecia. 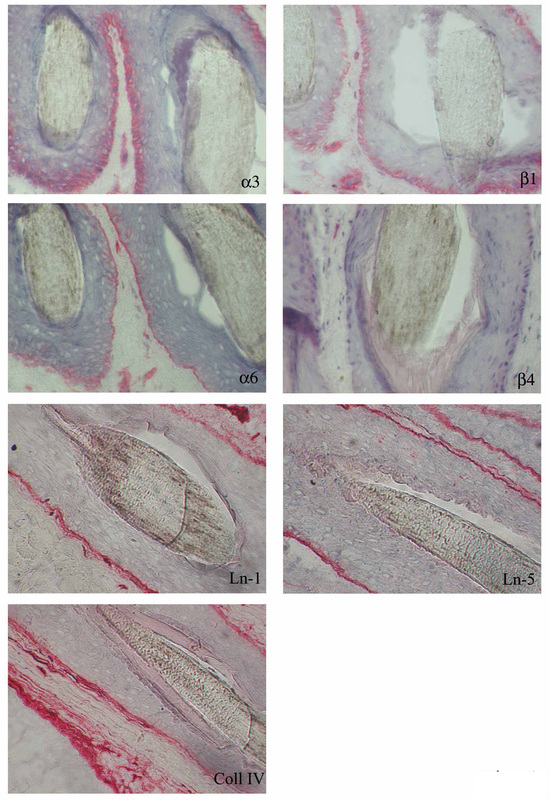 In this study we focused on the expression of integrins and basement membrane (BM) components of the hair follicle in active LPP lesions and in healthy subjects. Integrin α6β4, a component of hemidesomsomes, is normally confined to the basal keratinocytes of the hair follicle and has functions involving keratinocyte recognition and attachment to the BM. Integrin α3β1, a receptor for laminin and collagen, is localized on the basolateral layer of the basal keratinocytes, suggesting that it also has a role in cell-cell adhesion. In a previous study (performed in mice), Brakebusch et al. demonstrated that β1 integrins have an important role in hair follicle morphogenesis, in the differentiation and in the cell-cell interaction of follicular keratinocytes. On the other hand, altered β1 integrin expression in follicular keratinocytes provokes dermal fibrosis and hair loss . This study showed an altered distribution of integrins in follicular keratinocytes in LPP involved areas. Integrin α3β1 was distributed in a pericellular pattern, the α6 subunit was present with a basolateral distribution while the β4 subunit showed discontinuous expression at the basal pole, and occasionally basolaterally. In uninvolved skin of the scalp the distribution of α6β4 was exclusively basal. These pathological aspects are also found in erosive lichen planus vulvae and cutaneous lichen ruber planus [9, 10]. This study showed an altered distribution of integrins in follicular keratinocytes in LPP involved areas. The altered expression of integrins may be provoked by cytokines and proteases released by peri- and intra-follicular T lymphocytes, mast cells and macrophages [11, 12]. Altered expression of integrins provokes the loss of adhesion of follicular keratinocytes to the stroma and could explain the artifactual clefts observed in histological samples (Fig. 3) and the phenomenon of easy plucking of the hair, with a "gelatinous" root-sheath containing stem cells (Fig. 4). An artifactual cleft between the epithelium and the stroma of the scalp skin in a patient with LPP. Original magnification 100×. Pulled-out dysplastic anagen hair: the ORS contains remnants of the sebaceous gland at the level of the isthmus. For this reason, scratching due to pruritus, but also during normal treatment such ascombing and shampooing, as well as inadequate topical therapy(e.g. ointment), could accelerate the process of irreversible defluvium. No sources of founding contributed to the development of this article. DR conceived the study and did the case record search, coordinated the write-up and submission of the article. FC and CA were responsible to see the patients at hospital. AUF carried out the literature search. SC and ER performed the immunohistochemical staining. FC revised the manuscript.